Flippin' Illini Gymnastics Club – The best flippin' club on campus! The best flippin' club on campus! 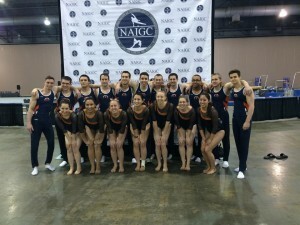 The Flippin’ Illini gymnastics club is a University of Illinois student run sports club that is part of the National Association of Intercollegiate Gymnastics Clubs (NAIGC). We provide any University of Illinois student with the opportunity to compete, practice or learn gymnastics for the first time. No experience is necessary. Our goal is to have fun with a sport that we love and meet new people.If you have questions, feel free to e-mail us. We always look forward to new people joining the club. For details about where we practice click on the details tab. Joining the Flippin’ Illini is as easy as 1, 2, 3. Come talk to us at quad day or practice to get on the email list. If you missed quad day or the informational meeting, don’t fret. Just come to any practice and ask to speak to one of the team presidents. We practice in the gymnastics balcony (top floor) of the Kenney Gymnasium on Wright St. and Springfield Ave. Practices are 6:30-9:30 pm Monday-Thursday during the fall and spring semesters. We practice at the same gym as the Illini varsity teams so the facilities and equipment are excellent. The flippin illini gymnastics club is a part of the NAIGC. All the meets we attend can be found on the NAIGC website. The meets are always a lot of fun with a relaxed atmosphere. All club members are welcome to attend any meet but all meets are optional. The club usually competes at four invites during the year and also competes at Nationals in the spring semester. Meets are on Saturdays so we leave Champaign either Saturday morning or Friday night. After the meet, the host team has a social gathering so we stay overnight and return to Champaign on Sunday. In order to practice, you need to download and print these two insurance related forms. You need to fill out the Emergency Card, and informed consent and waiver and turn them in. Gym Fees will be $150 per semester. Gym fees include standard meet fees, gym use, and coach payment.